When you buy CO2 extinguishers from us we give you much more than just a new extinguisher – we will also deliver, fit and commission absolutely Free of Charge. If you’re looking to buy CO2 extinguishers, you’re probably concerned about electrical fire risk. CO2 extinguishers are usually used for fires involving electrical equipment such as computers, although they also work on some flammable liquid fires, or ‘class B’ fires (read more here). However, did you know that, when you buy CO2 extinguishers on the internet, they must STILL be commissioned by an approved person. You can end up spending more when you meant to spend less. That’s why we always offer a complete, FREE, end-to-end service when you buy CO2 extinguishers from us. We’ll leave you 100% compliant with regulations (not to mention insurance requirements). You will find buying a CO2 extinguisher from us is affordable, easy, and fast – no matter what the nature or size of your business. Call 0845 845 3001 today to buy CO2 extinguishers or book a FREE SURVEY visit from a BAFE extinguisher engineer. Our 5 year guarantee on extinguishers also gives you peace of mind. Our extinguisher engineers are BAFE registered, which means they are overlooked by a 3rd party industry body. They will give you friendly, impartial advice, plus provide a free survey service if you’re not sure exactly what you need. 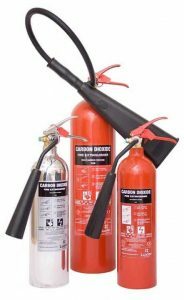 Why should you buy CO2 extinguishers from us? For a quote to buy CO2 extinguishers or to arrange a free survey, please just contact our friendly team on email: info@surreyfire.co.uk, or by phone: 0845 845 3001. They’ll be happy to help.